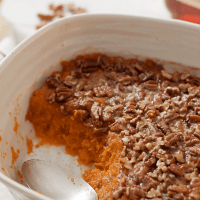 This bourbon sweet potato casserole with buttery pecans has a little less sugar and butter for a boozy, not-too-sweet holiday side dish! For regular weeknight dinners, I bake and serve them as is; we sometimes add a sprinkle or salt and pepper, but they really don’t need much. Or maybe I make my maple cinnamon sweet potatoes or spicy sweet potato rounds, which are both a quick and easy way to prepare them. And when it comes to Thanksgiving sweet potatoes, I like giving them a little something special, a little flavor boost, a little extra love. 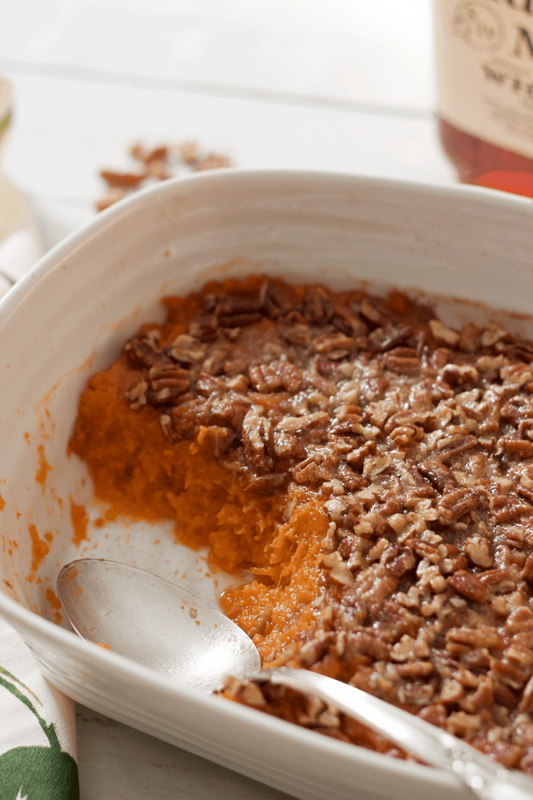 Not to knock that classic combination for a sweet potato casserole, but I just don’t care for the sickly sweet version. So I’m gonna skip the marshmallows, but I’m still going to ramp up the flavor and make this a special dish. 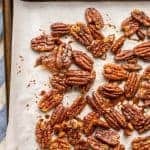 I’ve added some bourbon to give it a little depth and topped it with a buttery pecan crust that brings a bit of salty and savory to cut the sweetness, plus a great crunch to add some texture. You’re going to go crazy for that topping! I’ve also reduced the butter and sugar you’d normally see in a sweet potato casserole, but trust me, this is still plenty rich and plenty sweet. And can we talk about the aroma when the butter and brown sugar and bourbon hit the hot mashed sweet potatoes? You’ll feel a little light headed as you stir that delicious mixture. 😉 And then you’re gonna top it with the pecan streusel of sorts, creating the perfect little crust for the sweet potatoes. 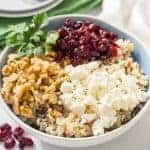 Holiday happiness in a dish! 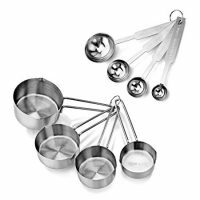 Now, we all have heard that most of the alcohol evaporates and cooks off when cooking or baking. But I did a little digging — I’m a health and nutrition editor, after all — and some studies have shown that not ALL of the alcohol evaporates. Depending on the preparation, cooking method and cooking time, up to HALF of the alcohol content can remain in the final dish. So if you’re concerned, keep this for just the adults at the table. You can prep this ahead! Make the casserole through step 4 in the recipe instructions below. Then cover and refrigerate. When ready to continue, remove the casserole dish from the refrigerator to come to room temp while the oven heats up. 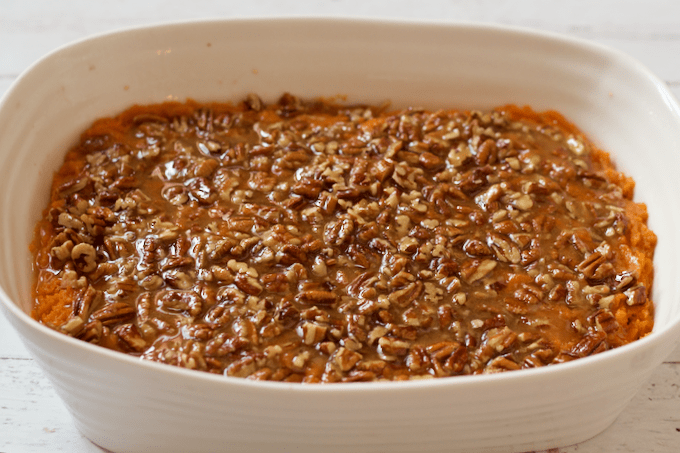 Make the pecan topping and add it to the top of the casserole just before baking. You’ll probably need to bake it for a little bit longer, about 35 minutes total. 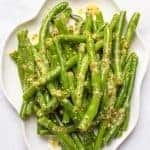 And if you need some other ideas for holiday sides, my super quick + easy green beans with mustard butter sauce, roasted Brussels sprouts with bacon and red onion and 15-minute easy cranberry sauce are all good picks! 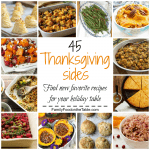 Cheers to boozy sides — enjoy! And happy Thanksgiving! P.S. Check out my new VIDEO for this recipe! Sweet potato casserole gets remade with a good dose of bourbon and a little less sugar and butter for a boozy, not-too-sweet holiday side dish! Preheat oven to 400. Place sweet potatoes on a foil-lined baking sheet and bake at 400 for one hour. Remove from oven and reduce oven temp to 375. Once the sweet potatoes are cool enough to handle, peel the skins off and place the potatoes in a large bowl. Add 2 tablespoons of butter, 1 tablespoon of brown sugar, bourbon and salt. 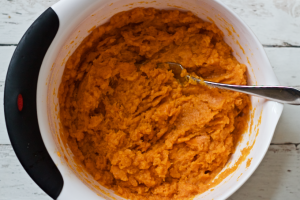 Use a fork to mash the sweet potatoes and mix them well with the other ingredients. 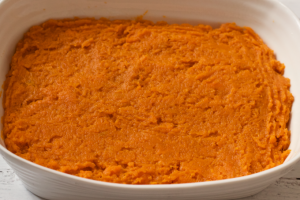 Spread the sweet potato mixture evenly in a greased 3 quart casserole dish. In a separate bowl, combine the remaining melted butter, brown sugar, cinnamon and nuts. Stir well to combine then spoon the mixture evenly over the top of the casserole. 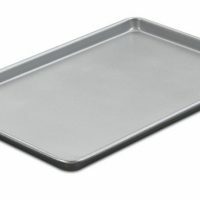 Bake at 375 for 25-30 minutes. Serve warm or hot. You can prep the casserole ahead through step 4. Cover and refrigerate. When ready to continue, remove the casserole dish from the refrigerator to come to room temp while the oven heats up. 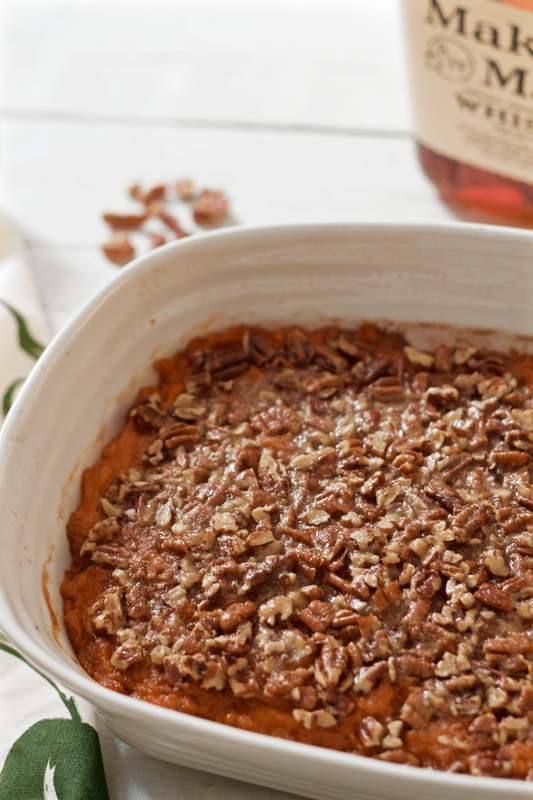 Make the pecan topping and add it just before baking. Bake for 35 minutes. I’m always immediately hungry after reading your recipes and seeing your (delicious) photos!! Thanks for sharing. Definitely pinning this! Thanks so much, Pamela!! Hope you have a wonderful Thanksgiving! So happy to hear you loved it! Thanks Randiah! Happy Thanksgiving! Haha, thanks Tania! I am a serious potato fanatic! Also a bourbon fanatic 😉 Hope you give it a try! 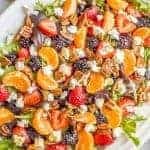 Recipe looks awesome. Thanks for sharing with us at Throwback Thursday. Hope to see you again next week. I need to get together with that fine lady for a plateful of these and a little cocktail to go with it 😉 Cheers! I was going to make this for Thanksgiving this year, but was feeling lazy and wanted to use canned yams! Is this something you have ever tried? I bought two giant cans and wasn’t sure if I should use one or two cans. Thanks for your help! Love your site! Hi Lynz! I have not substituted canned yams in this recipe before, but you could certainly try it as a shortcut. I’m not sure how much is in your cans, but I’m thinking you’ll need at least 5 cups worth of mashed yams – enough to make a decent layer in the bottom of your casserole dish. Would love to hear if you try it! 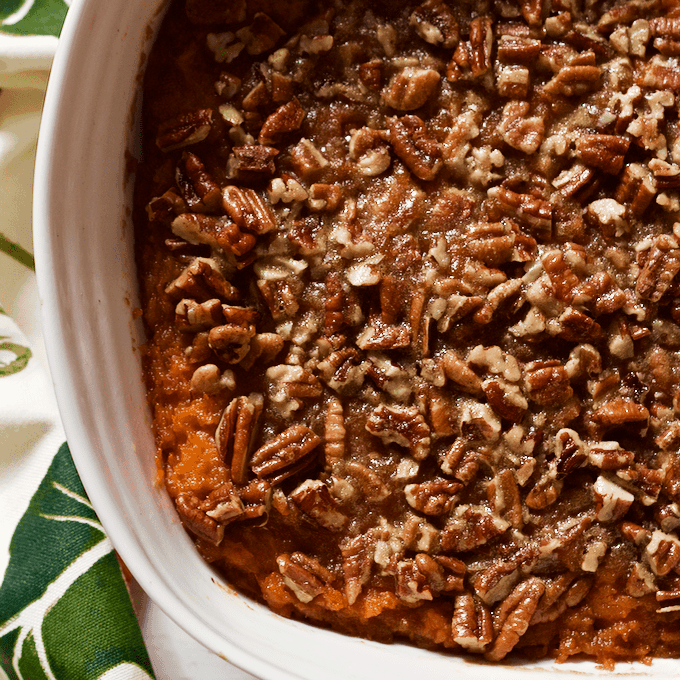 This sweet potato casserole looks wonderful!! This looks so tasty! 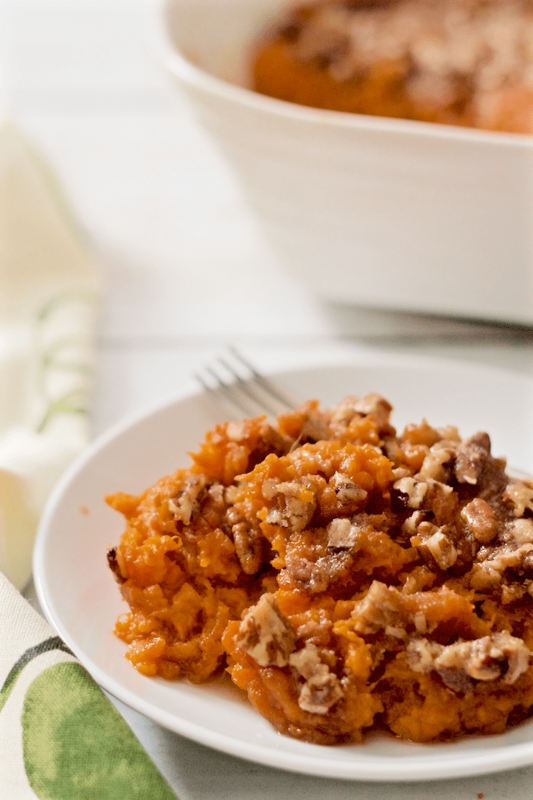 Love sweet potato casserole! Me too – such a classic on Thanksgiving! Thanks so much Carolyn! I hope you give it a try! Recipe says cook time 1 hr 25 min but then in the details says 25-30 min. So do you cook 1 hr 25 min first then the 25-30 is if you are re-heating? Hi Jenny! The total cook time is 1 hours 25 minutes, which includes the time to bake the sweet potatoes. 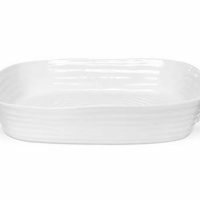 Once you’ve assembled the casserole, you bake it for 25-30 minutes. Hope you enjoy it! Makes sense now. Thank you! Happy Thanksgiving. I have made my sweet potato casserole like this, start to finish for 47 years. Everyone loves it! Maybe I put a little more bourbon. This is the first time that I have run across the recipe in print. Love the potato’s baked, not boiled, they have richer flavor. I love that this has been a long-time dish of yours Ruth! 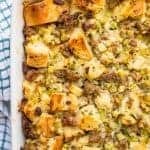 I just adore the way the bourbon bumps up the flavor of the sweet potato casserole and I completely agree with you that baking the sweet potatoes gives them a much richer flavor. I think it really helps caramelize those natural sugars. I hope you have such a wonderful Thanksgiving! Thank you for coming up with a recipe that isn’t so sweet. I dislike marshmallows on any vegetables. Husband is diabetic. I made it tonight with Makers Mark. I used a guava instead of brown sugar. It’s fantastic. I’m so happy to hear you enjoyed this Mary! I’m with you – I don’t need marshmallows with my veggies so I’m glad this was a good option for you, too. And I love the idea of using guava! Can the alcohol be simmered in a small saucepan before adding to the recipe to lower the alcohol content even more than the approx. 40%. What’s your opinion of bourbon whiskry extract to replace the real deal? I’ve never used such a product. Hi Rosemary, if you are concerned about the alcohol content and don’t have any bourbon or whiskey on hand to use, I’d suggest just leaving it out altogether.